Thank You, Volunteers, Leaders, Sponsors, and Partners! From the Powder River in Baker City to Harris Beach near the California border, over 4,000 dedicated volunteers came out in force on Saturday, September 29 to improve Oregon as part of the annual SOLVE Beach & Riverside Cleanup, in partnership with the Oregon Lottery. This year, an estimated 42,000 pounds of trash and marine debris, and 43,000 square feet of invasive, non-native plants were removed from 139 project sites including rivers, neighborhoods, parks, and natural areas across the state. Part of the International Coastal Cleanup, beach cleanups took place along all 362 miles of the Oregon Coast, drawing thousands of locals and visitors alike. "SOLVE's Beach & Riverside Cleanup gives thousands of Oregonians the opportunity to help preserve our state's special beauty," said Oregon Lottery Director Barry Pack. "Thank you to everyone volunteering at one of 139 SOLVE project sites across the state and being part of another successful SOLVE Beach & Riverside Cleanup." The most common items found during the event were pieces of broken plastic, cigarette butts, food wrappers, bottles, cans, and caps. Interesting items found by volunteers included a message in a bottle at Fort Stevens State Park, 25 tires along the Salmon River, several shopping carts on Newport beaches, a door on Bastendorf Beach, and an old grill along Bear Creek Greenway in Ashland. Today, the success of this event is due in large part to the dedicated Project Leaders, Beach Captains, and garbage and recycling companies that step up to coordinate and volunteer their time at projects throughout the state. "This event is truly inspiring because it starts with Oregonians noticing a problem in their local neighborhood, park or beach and wanting to make a difference," said Maureen Fisher, CEO of SOLVE. 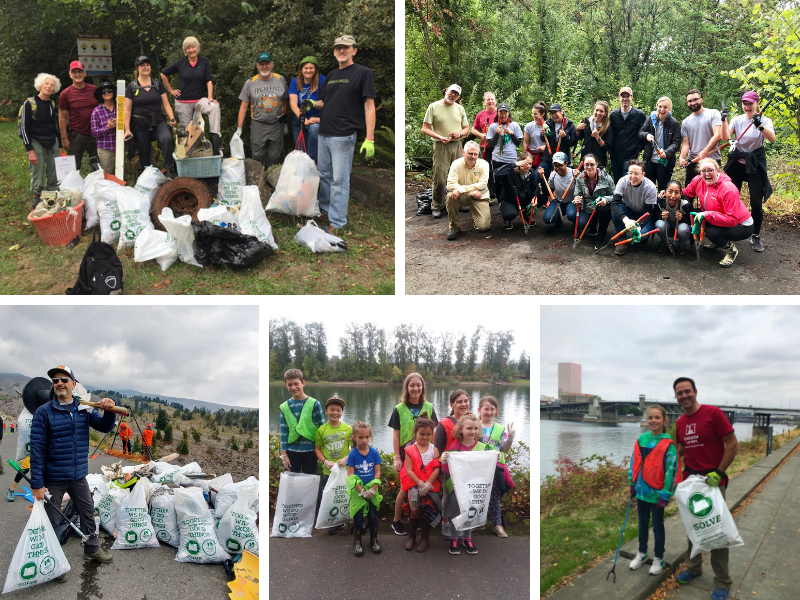 "Whether they picked up trash, restored a natural area, or led volunteers in these efforts, our volunteers and partners made this event possible and our state cleaner and safer for all Oregonians." The Beach & Riverside Cleanup began in 1984 at "The Plague of Plastics" after Oregonians, Judie Hansen and Eleanor Dye, were inspired to rid the state's beaches of litter. Thirty-five years later, the event has expanded to include litter cleanups and restoration projects across Oregon and has served as a cleanup model that spread across the nation and throughout the world.